This fraternity lodge is supposedly haunted by a long-dead member known as ‘Dapper Don’. Visitors report only occasional instances of paranormal activity, such as strange noises and objects moving around of their own accord. 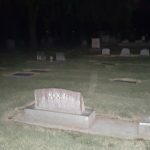 Yeah, it’s a trip, i was just looking at these photos one day and it stood out like a sore thumb, so i thought i’d look into it, and i found this site so i posted it, thought it might be of some use to the paranormal community, if it counts haha.